Software giant Oracle is buying US rival Siebel Systems in a deal worth $5.85bn (£3.2bn) in cash and stock. Oracle is offering $10.66 per Siebel share, 16.8% more than Siebel's closing share price on Friday. Siebel makes software to help companies manage their relationships with clients. 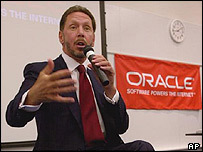 The takeover by Oracle had long been predicted by analysts. 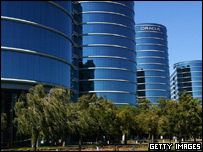 It is the latest acquisition by Oracle which bought another rival, Peoplesoft, in December last year for $10bn. "In a single step, Oracle becomes the number one CRM [customer relationship management] applications company in the world," said Oracle chief executive Larry Ellison. "Siebel's 4,000 applications customers and 3.4 million CRM users strengthen our number one position in applications in North America and move us closer to the number one position in applications globally." Oracle said the deal had the approval of the Siebel board and that the takeover was expected to be completed in 2006, subject to regulatory approval. It also said that the customers of both firms had long called for them to come together. The purchase of Siebel is likely to help Oracle achieve its stated goal of 20% long-term annual earnings growth. Software firms analyst Peter Jacobson of Kaufman Brothers said some Siebel shareholders might call for Oracle to pay a higher price, but at the same time he noted that Siebel's performance had not been brilliant in recent times. "More often than not, these deals go through at agreed-to valuations," said Mr Jacobson. Oracle shares rose 21 cents to $13.49 dollars after the deal was announced, while Siebel shot higher by $1.16 or 12.7% to $10.29.